Natural resource organizations face unique challenges with regards to data collection, maintenance, analysis and visualization. MB&G has worked closely with our clients for decades to address these unique challenges by providing software services that range from needs assessment to custom application development. We constantly track the latest advancements in GIS, mobile, web, database, and analysis technologies to help guide our clients through the often complicated technology decision making process. We focus our software application efforts on technologies that are the most relevant to natural resources fields including desktop and web GIS, mobile data collection and mapping as well as web applications for data management, forest modeling, and analytics. As Esri business partners and active members of the Esri developer network, we specialize in provide GIS solutions ranging from ArcMap Add-ins to offline mobile mapping solutions to enterprise data management solutions. MB&G MobileMap™ – Custom offline mobile mapping application that provides full access to GIS data on Android devices even when disconnected. 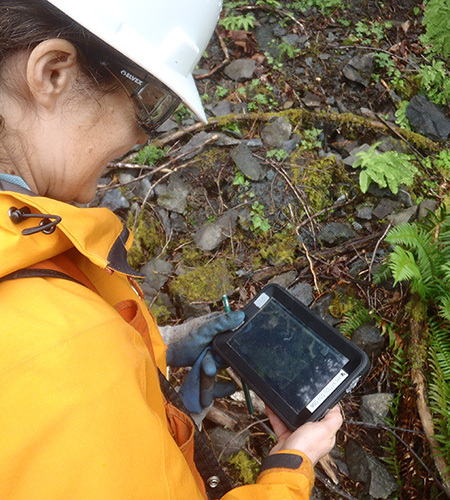 MBG Tools – A stand-based inventory application that puts forestry data at your fingertips. MBG Cruise - An application for collecting forest inventory data in the field. Spatial CMS – Combines the best properties of GIS and Content Management Systems into a web framework that helps organize, maintain, analyze, and share key business data.